Wearing what are 2 of my favorite trends at the moment: a knit dress & a mini bag. Perfect for day, great for night, I love that ease & casual appeal that the right knit dress brings to a look. The one I am wearing in today’s post is definitely a favorite at the moment, mainly because of the cut (hello turtleneck and side-slit) but also, I am never not a sucker for this particular shade of blue. Sadly it is sold out everywhere, but if you scroll down to the bottom of this post, I’ve found a few similarly pretty options in tons of cute colors and shapes. 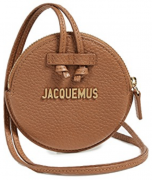 This mini bag from Jacquemus is my other obsession du jour! Love, love, love suede in this particular color because it pairs so well with Fall/Winter color palette of grays, blues, creams, browns and caramels, but I think the reason I’ve been wearing it non-stop lately is because it adds that very clean finishing touch to an outfit. Basically it never overpowers a look, yet adds a bit of an interesting touch to an outfit! Love that! Once again, if you scroll to the bottom of this post I’ve managed to find a very similar option on sale! Also, since there are a ton of amazing SALES going on right now (I know I’ve been shopping like a crazy person these past 2 days), I thought I’d give you heads ups on some of the best Deals & Steals going on at the moment. Those boots are un-REAL!! Love them!! Loooove white boots, thank you! Love ♥️the baby bleu colour … so cute, cozy and charming! Such a beautiful outfit! And that dress is too cute! Soo cute, right? Thank you! LOVE the knit and boot combination. the colors are gorgeous on you! Great combo for fall, thank you! The blue dress is gorgeous. Honestly, I would have skipped this color of the dress in the shop. But your posts make me understand that everything is possible, with some awesome accessories the dress looks fab even at this time of the season.